In the living room of Docker Nook, an antique camelback leather sofa piled with understuffed down cushions, late-19th-century William Morris-weave curtains and a floor lamp from Kime’s own line. The sitting room at Docker Nook, with a fireplace surrounded by Delft tiles and a cozy club chair. An unassuming sign of a metal cutout sheep with “Docker Nook” written underneath announces the Cumbrian retreat of Robert Kime, Britain’s most esteemed interior designer. 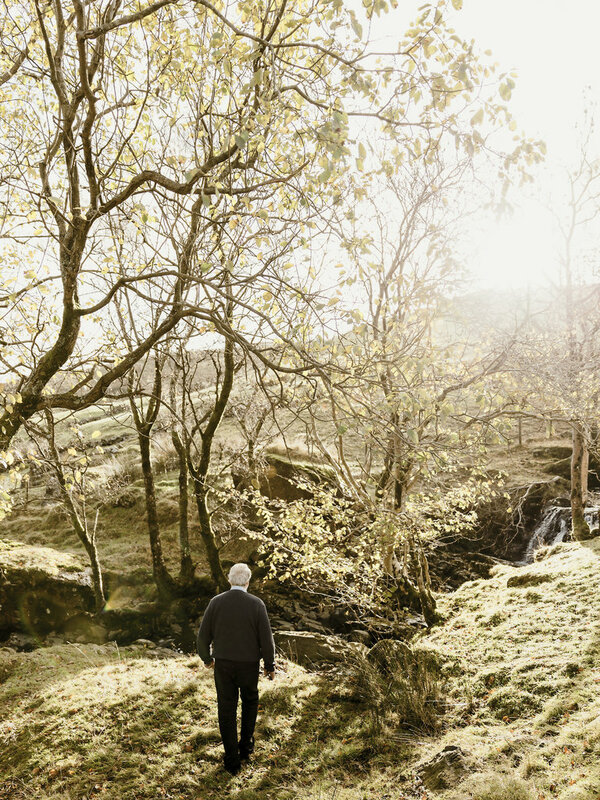 Past a rickety bridge and ragged hills with sheep grazing on either side, a low golden light streaming through the valley, is his charming, white-painted farmhouse. 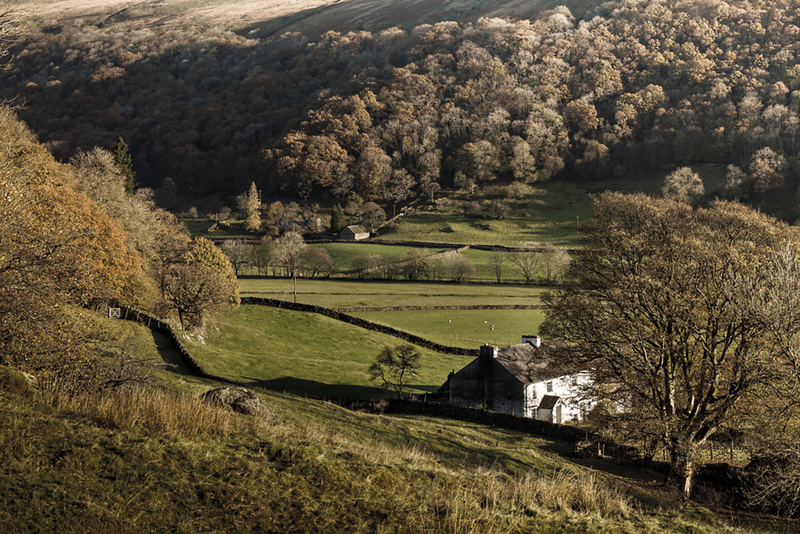 The property could not be in a more beautiful setting — the picturesque Longsleddale valley near Kendal in the north of England. Appearing untouched by time, with its working sheds and a beautiful barn that Kime converted into his library, the bucolic scene must look much like it did in the 18th century. While Kime lives primarily in London, in an airy apartment above his design shop in Bloomsbury, Docker Nook is his quiet escape, where he idles the days away doing little more than reading by the fire and walking the grounds. Kime is without peer in creating the lived-in, classic English look that eminent figures such as the Prince of Wales and the Duke of Beaufort call on him to create for their homes. Yet this place proves he’s as talented at decorating a humble farmer’s cottage as he is a palace. The interior is quite simple and comfortable, but everything is of great quality. Each room feels like it’s been there forever, for Kime understands the value of leaving alone as much as he changes. Yet the telltale signs of his work abound: loose-gathered lampshades on thin silver candlestick lamps, antique octagonal occasional tables, small cushions in all sorts of vintage linen and Uzbeki fabric and very deep, soft upholstery. In general, his style tends toward the masculine, with striped Anatolian blankets turned into curtains and palettes of dark reds. Having started his career as an antiques dealer, he uses a lot of heavy oak furniture and antiquities in his work. Unless you are familiar with Kime’s approach, you would think that the place had been untouched by an interior designer. This might be because he is a dealer first and a decorator second. Kime was born in Hampshire in 1946 and left school at 16 to work as an archeologist in Greece and Israel before studying history at Oxford. Throughout university, he would deal antiques to his fellow students to help fund his studies. After Oxford he went to Sotheby’s and from there to work for Miriam Rothschild, selling pieces for her. “She was more hands-on than a patron,” he says. “She let me get on with things but loved the fact that all her stuff was recyclable, a lot of Rothschildiana.” Kime admits he never intended to become a decorator. “It was looked down upon in those days,” he says. “I figured, ‘I can’t afford to be a decorator, but I’d like to do it,’ so I took Fridays off [to try] and gradually it took over.” Yet dealing remains his passion, and buying trips to places like Turkey and Egypt still inspire him. “I know I can go to dealers I haven’t seen for years and it’s wonderful,” he says. “It is those trips that keep me interested and alive. Those are long friendships.” Kime bought Docker Nook in 2008, after his late wife, Helen Nicoll, who grew up in the neighboring valley, introduced him to the area. Over the years, the farmhouse, built in 1700, had been badly renovated. Kime set about uncovering what the previous owners had hidden behind plasterboard walls and low ceilings. “Everything had been done in the cheapest way,” he says. “If a wall was damp they just put one up in front of it. It was depressing. I knew that if you took away what they added you would get to the basic structure.” Among the treasures he found was a colossal stone lintel over the main fireplace along with the large fireplace itself, which had been hidden behind a smaller one. A view of Docker Nook from the hill behind the house. It is hard now to tell where the original house ends and Kime’s work starts. 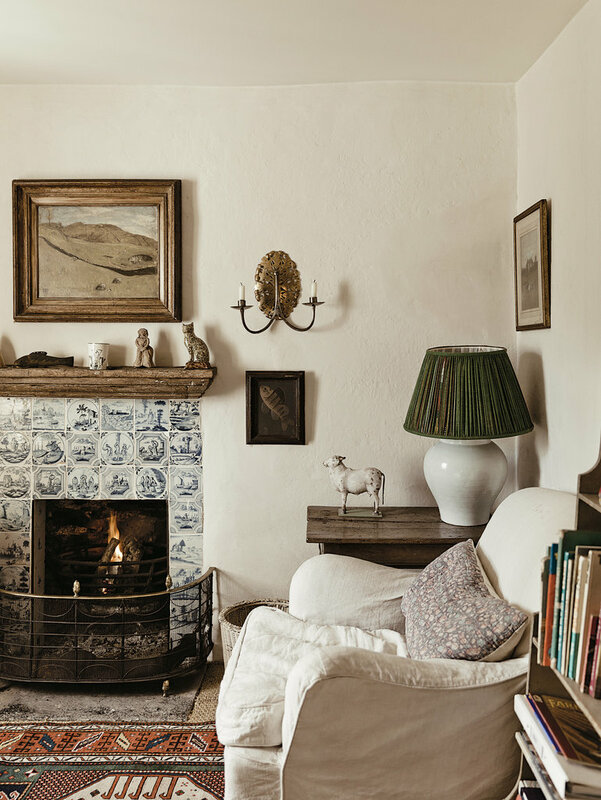 The small sitting room that you come straight into from the outside has stone floors — which he installed — and a pair of 19th-century Edwardian chairs upholstered in a blue William Morris weave. The room is spare but by no means austere. It feels appropriate to the period of the house but, as Kime says, “By going back to the original I didn’t want to go back to a level that was historic, that’s too cold . . . dreadful,” he says. “It is unacademic, what I do. I want it to be correctly informed architecturally but I want it to be real for me.” The overall effect is reflected in his two London stores, where he sells his own collection of furniture, lamps and fabrics — “I can’t get the quality in new that I can in old, so I make them look old.” These are mixed with lampshades and cushions made from all sorts of vintage textiles from Uzbekistan, Egypt and Turkey, and old French linens and silks, alongside period antiques. I know I can go to dealers I haven’t seen for years and it’s wonderful,” he says. “It is those trips that keep me interested and alive. Those are long friendships. The larder (formerly the dining room), the only room with original stone floors. A small room off the sitting area is classic Kime. He found an old wood-paneled wall, added Delft tiles around the fireplace, a soft, inviting club chair and a telephone to create an utterly simple, cozy room. In other areas, he expanded — another sitting room with a television was originally five rooms and a staircase. 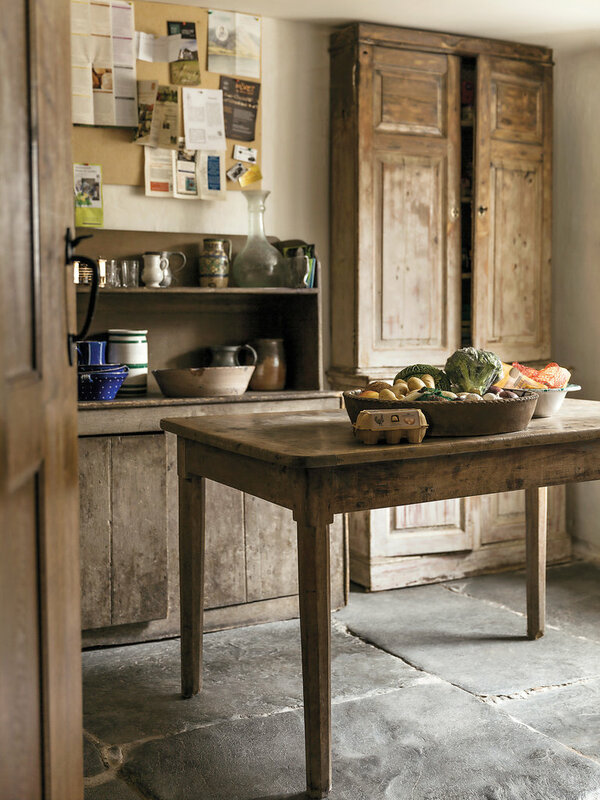 In the old barn that houses his father’s extensive collection of books and Robert’s many history titles, a pair of plate-glass shop doors let the light pour in, affording sweeping views of the spectacular landscape outside. 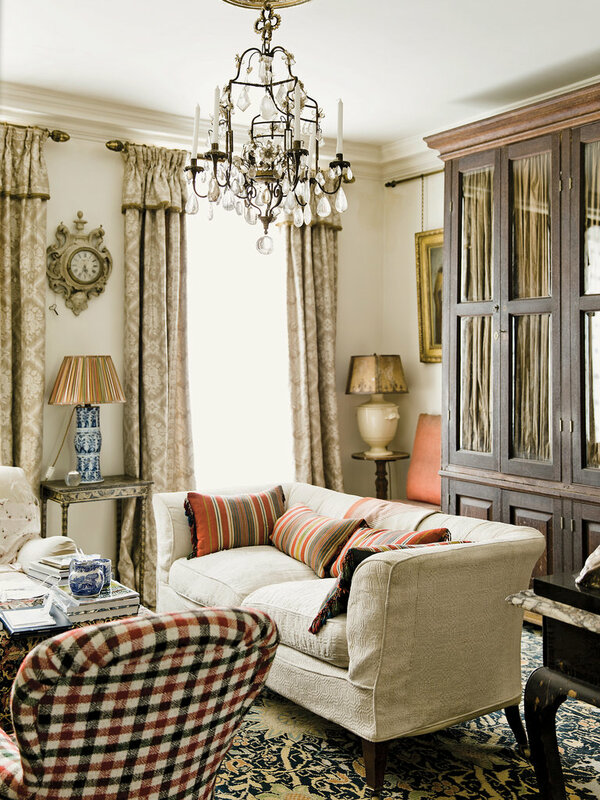 While his country home is relatively humble, his London apartment is much more sophisticated and quite formal. It is very calm and light, and gives the feeling of stepping back in time, almost to a city in the Middle East. I always half expect to hear a distant call to prayer when I am there, although this is the heart of Bloomsbury and the view from the roof terrace is dominated by the spire of Hawksmoor’s St. George’s church. The walls are plastered with pictures and a combination of British and Islamic pieces. An Augustus John painting hangs on one wall, a framed Mughal tent on another. 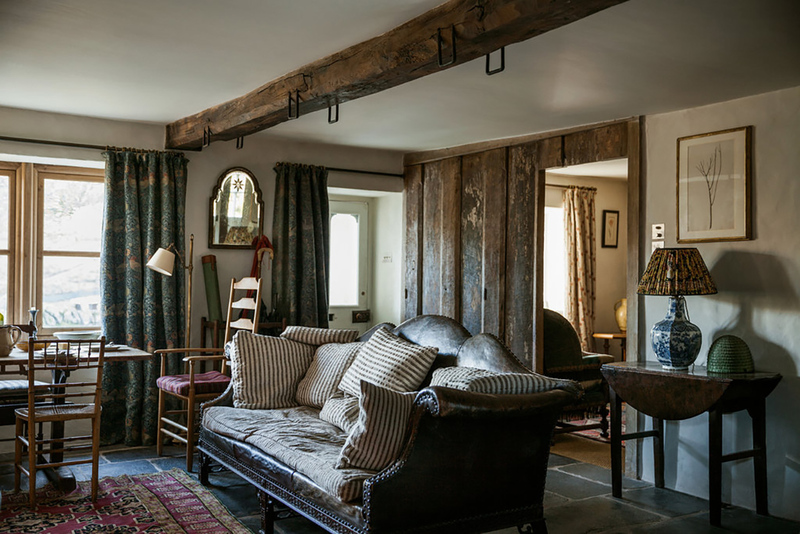 The curtains in the drawing room are made from a lovely antique Syrian weave. There’s a charming quirkiness in certain details. The shades of the staircase windows are made out of old pieces of fabric with silk fringes hanging off the bottom. 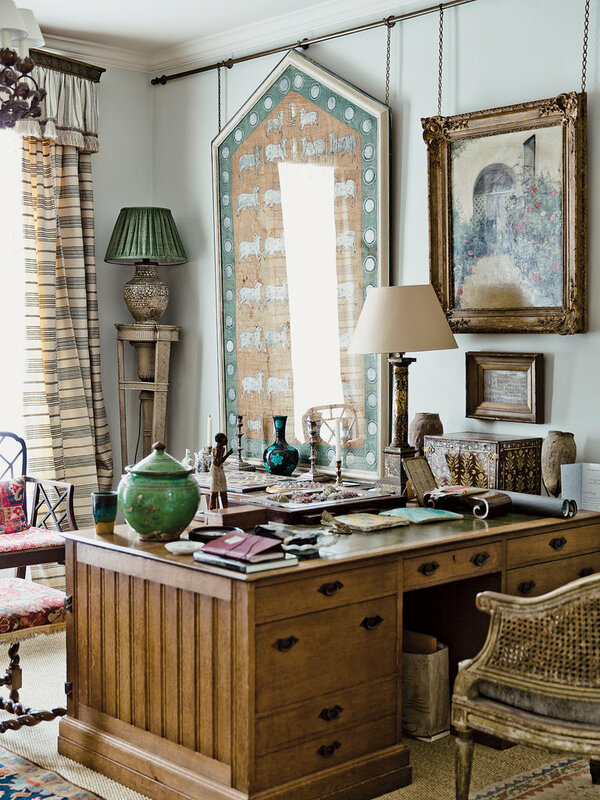 The walls of his dressing room are battened with Egyptian cloth woven with silver thread. “This room is all the remaining pieces we had of that kind,” says Kime. He makes lining a room with various bits of textiles seem effortless. He doesn’t mind that the panels are all different and don’t match up perfectly — another reason why these rooms feel so relaxed. But it is his bedroom that ultimately defines what Kime stands for as a designer. 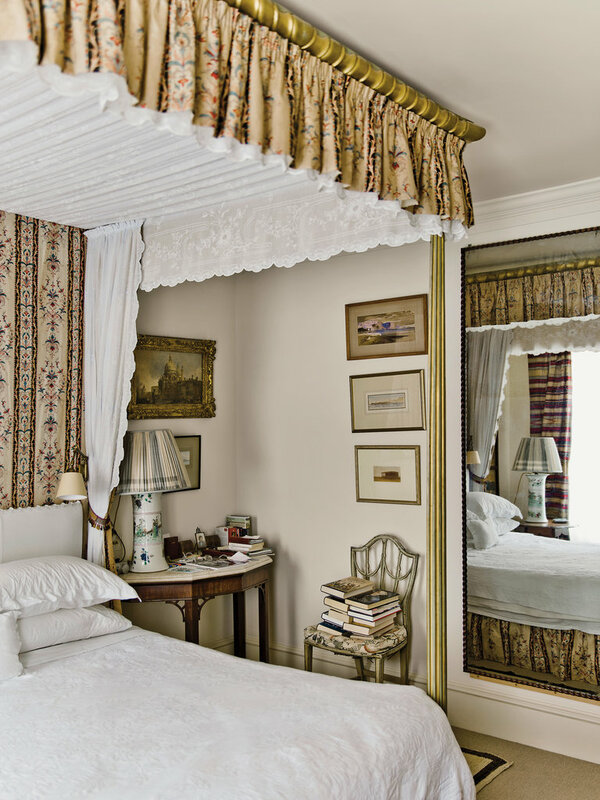 In the center of the room is a beautiful antique gilded four-poster bed with chintz curtains, lined with a delicate antique muslin voile. The headboard is covered in an old quilt with a scalloped edge along the top, giving it a homey finish. What is very obvious here is Kime’s unusual and unique talent for making rooms both masculine and delicate; they are never too feminine and never something you have seen before. 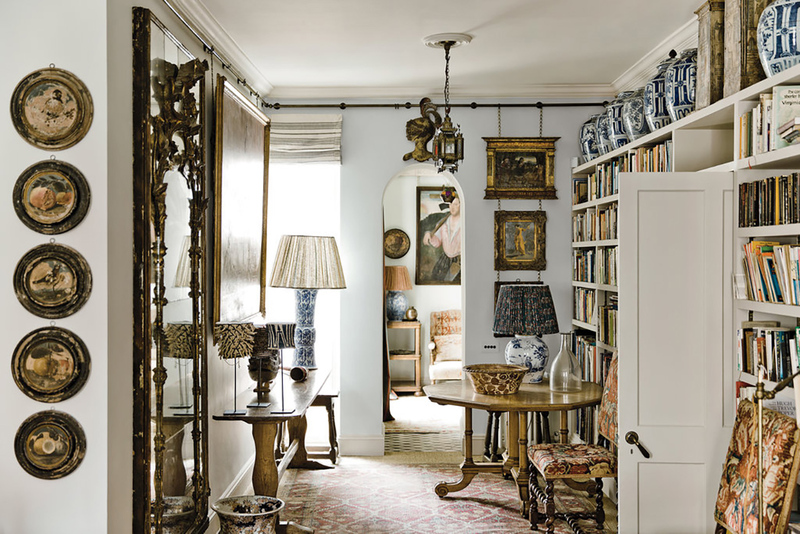 In the drawing room of Kime’s London apartment, a set of Italian tondi and a 16th-century painting depicting the flight into Egypt over an Augustus John painting of Dorelia hung on the pale blue walls. In the city, a framed Mughal tent near an Arts and Crafts desk, circa 1890. 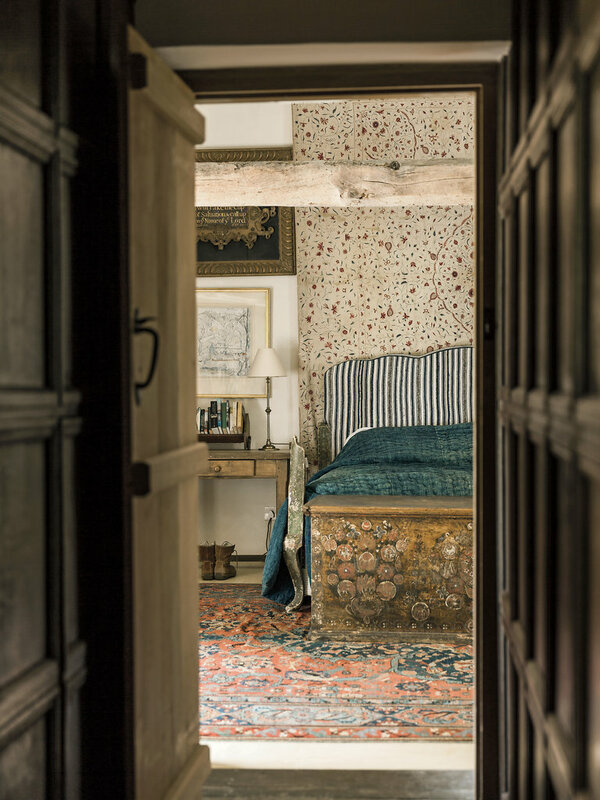 In the master bedroom of Docker Nook, a Queen Anne fabric panel hangs behind a headboard covered in an antique French linen; the chest at the end of the bed is an 18th-century Scandinavian blanket box and the rug is a 17th-century Oushak. In the city, the Downland sofa and Belgian linen curtains in the sitting room are from Kime’s own line and the rug is late-19th-century William Morris. 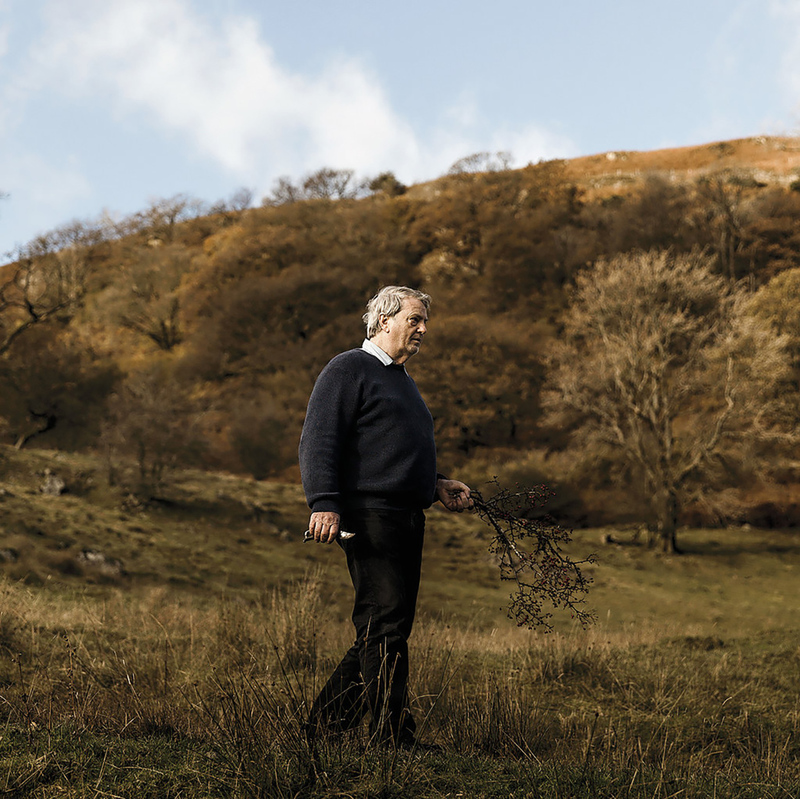 Robert Kime at dusk on the hill behind his house in the Longsleddale Valley in the north of England. Kime with secateurs, looking for branches to display in the house. This article was originally published in the The Luxury Issue 2014 issue of the New York Times T Magazine. Words by Rita Konig. Photos by Martin Morrell.